Members of the Sherman family of Porter Township were recognized for their commitment to agriculture by the Delaware County Board of Commissioners represented by Commissioner Barb Lewis. Pictured, left to right, front row: Barb Lewis, Jim Sherman, Susan Sherman, Denise Sherman and Bob Sherman; back row: Delaware Soil & Water Conservation District Board of Supervisors Ted Colflesh, Steve Sheets and Dan Lane. At the recent Delaware County Farm Tour, the Shermans of Porter Township were recognized by the Delaware County Board of Commissioners and the Ohio Department of Agriculture for their farm’s acceptance into the Local Agricultural Easement Purchase Program. In Delaware County, nearly 1,500 acres have been approved to be accepted into the program since 2016. The 177-acre Sherman farm has been in the family since 1892. These easements ensure farms remain permanently in agricultural production, supporting Ohio’s largest industry: food and agriculture. 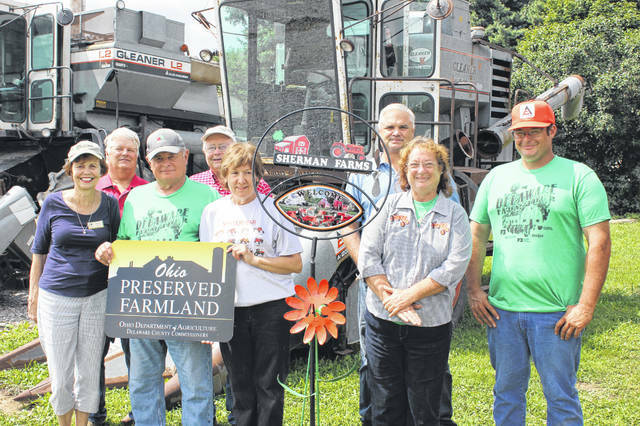 Presenting the Ohio Preserved Farmland sign to the Shermans was Delaware County Commissioner Barb Lewis. In Delaware County, the county commissioners serve as the local sponsor for the program, with the assistance of the Delaware Soil & Water Conservation District. To be eligible for the program, farms must be larger than 40 acres or next to a preserved farm, actively engaged in an agricultural use, participate in the Current Agricultural Land Use Valuation program, demonstrate good stewardship of the land, and have support from local government. The Shermans have been avid, long-term conservationists using crop rotation, no-till, waterways, field strips, livestock and feedlot fencing, and a bioreactor and phosphorus removal system. The Shermans have participated with USDA Agricultural Research Service and Natural Resources Conservation Service in edge of field monitoring and have graciously hosted many public tours on their farm. The mission of Delaware Soil & Water Conservation District is “Helping you help the land.” For more information on the various programs offered by Delaware SWCD and on the Local Agricultural Easement Preservation Program in particular, visit www.delawareswcd.org or call 740-368-1921.